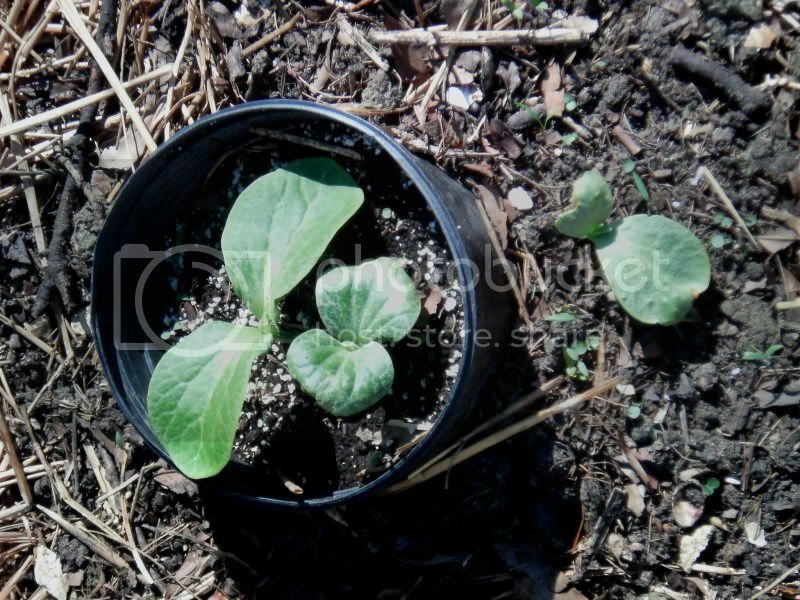 I have just 1 hill of Atlantic Giant Pumpkin growing and they sprouted. The 1 gal plastic pot is bottomless and I used a 1 gal jug cloche to warm up the soil. There were 3 seeds around the pot but only one seem to have sprouted and it's defective. If it was perfect, then I'd keep the big seedling in the pot and the one outside. As it is, do you think it's OK to keep the two in the pot ? (remember it IS bottomless, but they're a bit closer together than I like). Last edited by applestar on Thu Jun 17, 2010 3:50 pm, edited 1 time in total. You think so? OK. I'll wait. Oh yeah, I have a couple of cucumbers that have a defunct cotyledon. Wait for the true leaves, those will tell you if the plant's good or not. More than likely, the seedling will turn out fine. 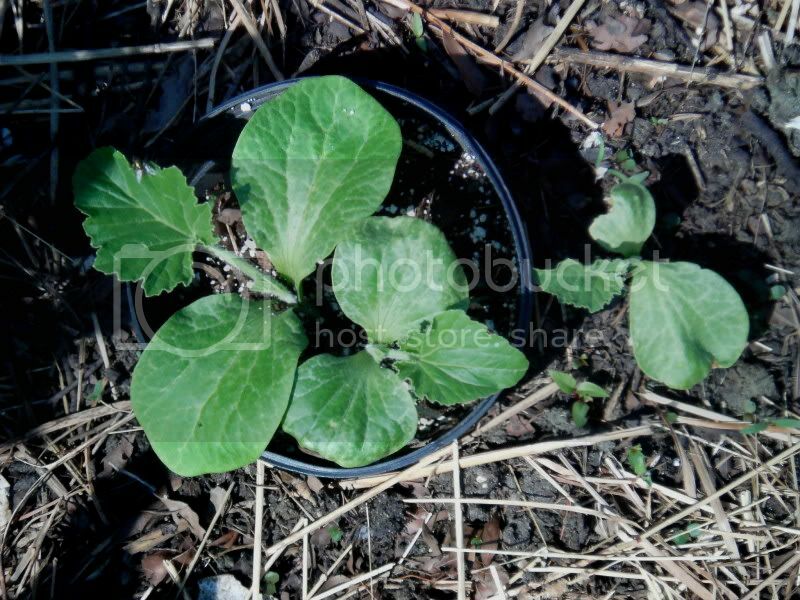 Apps, my AGP had a hard time getting out of their seeds & a few of them ended up with crinkled cotyledons like yours. We're still waiting to put ours in the ground since the field still needs to be worked first but should be going in this week! Can you believe they already grew their true leaves?! 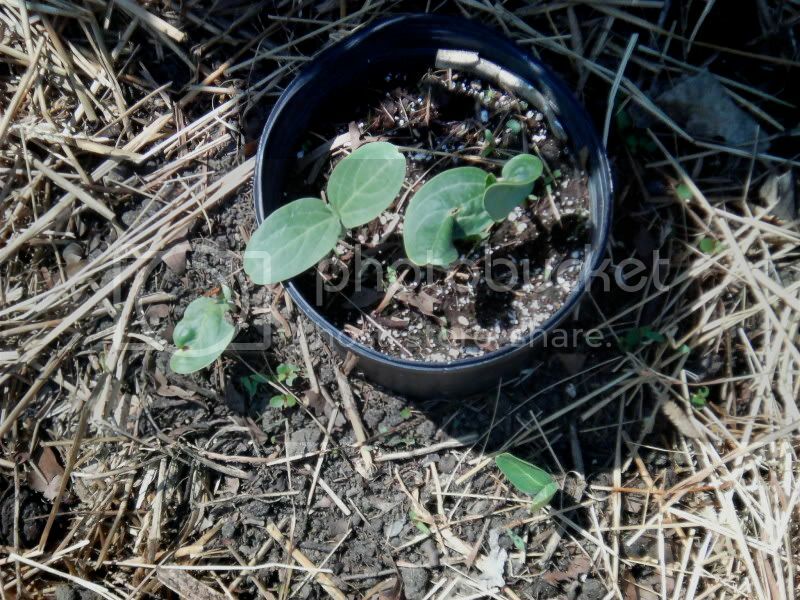 Here is also photo of the Bushel Gourd seedlings. What do you think? OK, help me out. What is the reason for the bottomless pot? Will the pot be left there for the growing season? Why some in the pot and some not in the pot? As far as which one to keep, and which one to pull, I would grow them all. Each vine will make a pumpkin or two. If you are really going for the grand prize, keep the best looking vine and feed it well. Of course in doing that you always run the risk of some critter killing the vine then you are done. I'm trying AGs for the first time. Just put them in today, might run afoul of first frost but I'm hoping for few big ones. I'm not about to babysit them to get anything huge but I would like to hit a few in the 500 lb range for the grandkids and some of their friends. I'm using the 500 number as the loader on my tractor will handle just a little over that at the height of a pickup tailgate. The bottomless pot was an idea I had for tricking the seeds to sprout even though the ground just didn't seem like it was warming up. 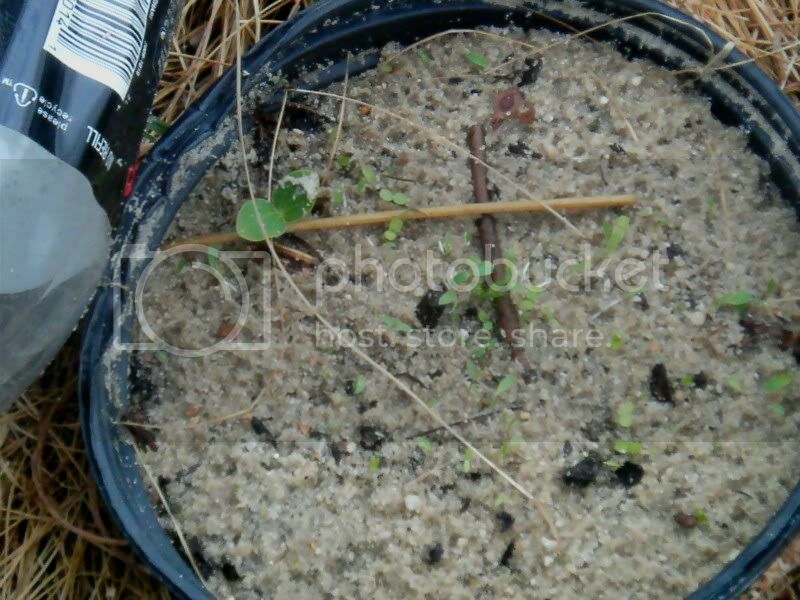 In all cases, the first ones to sprout were inside the pot so I think the idea is sound. The reason I thought they might need help was that the peas were slow in sprouting. Initially, I tried this with a hill of yellow crooknecks. Where I planted, the ground stays soggy for a long time in spring and the subsoil is clay + it's shaded in the morning until about 10AM. I'm still doing the sheet mulch ground prep in all cases, but I put down a shovelful of half finished compost, set the bottomless 1 gal pot in it, 1/2 filled with more compost, then with potting soil and planted 3 seeds inside, 3 outside. At the time, I was getting REALLY spotty germination from peas, which I interpreted to mean that the ground just wasn't warming up. I think I put the sand layer on top because it wasn't draining well and planted the seeds in that. To compensate for the light color, I put the cut-off black plastic bottom of the pot on top of the sand for the first 3~4 days. We did have frost warnings in the beginning of May and I put a WOW (closed into a tee-pee shape) over the YC's for a while since they already had grown true leaves. I think there are two growing inside the pot and one outside. It doesn't look like it in this photo but there's about 24" square space behind the monarda. The YC is SUPPOSED to *not* swallow up the Monarda but grow through the weedy gap between it and the Milkweed and then take up the additional mulched open space if necessary. I plan to leave the pot rim in place, but pile more compost around it and then mulch with hay so the vines won't kink on the rim of the pot. So you don't think they're too close together? I'm not out for the biggest of the biggest, just bigger than usual and fun for all. So you don't think they're too close together? 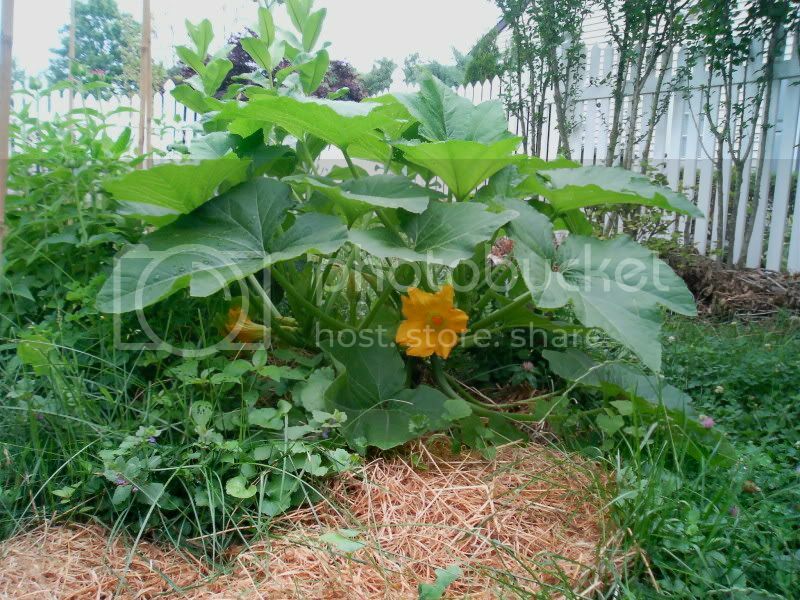 I am sure you are aware that pumpkin vines will send down roots from every leaf node if you let it lie on the ground and don't move it? 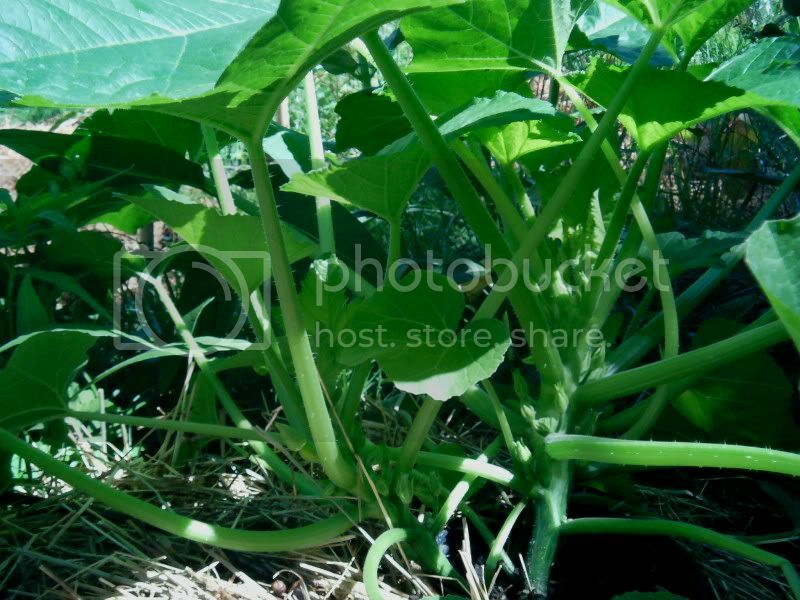 This spreads the roots out over a wide area when you consider that a pumpkin vine may get to 20 feet long. As long as the three vines go a different direction, they will be fine I think. Get the vines headed in the right direction early on and don't move them again. You might try germinating seed in a damp paper towell sitting in a dish on top of the refrigerator. Soak them overnight first. You will be amazed if you have never tried that. As soon as you see tails go plant them. Ah! I hadn't considered the roots along the vine! OK. We have a plan. I forgot about that pre-sprouting trick -- you did mention that before. I'll have to remember for the next time. Thank you. My squash has just came up. You are way ahead of me. Hey Apps, aren't you the one who gave me the link to that old periodical on "root development of vegetables"? 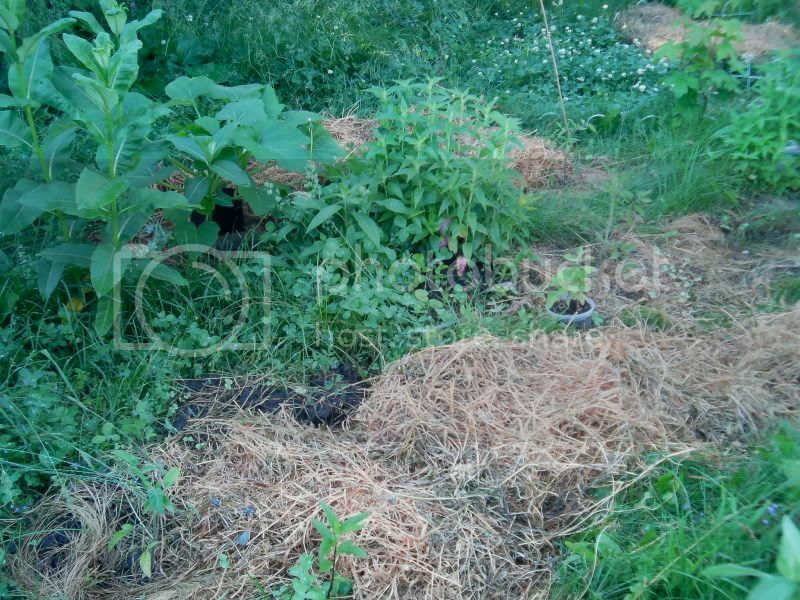 If I remember correctly, the root mass of squash plants extends out about 15+ feet! But I can't be one to talk. I have my bush plants on mounds so close together that it isn't even funny (:rolleyes: well, OK, maybe it is ). G5 - I know, I know, but it's an experiment. Here's the latest photo of the Crookneck. TWO female flowers are open but none of the boys are in bloom. I thought male flowers always bloomed first. I don't know what's going on. Should I pick the female flowers and eat them since they won't be pollinated?